Site of the Day - January 23, 2007 on Action 4 News Sunrise. Throughout this web site you can find many more vegetarian recipes, but most of them are for pizza, pasta or appetizers. This page, however, is a little different. Here I have published some of my easy vegetarian recipes, which are suitable for terrific vegetarian entrees and can be really enjoyed by non-vegetarians as well. 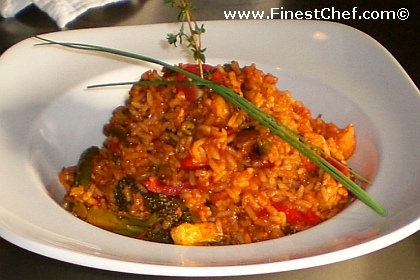 Now, I don't know if there is such a thing as vegetarian paella in the Spanish cuisine, however I created this tasty recipe for all the vegetarians who want to try the wonderful taste of the paella without all the meat and seafood. Ingredients: 2 cups parboiled conditioned rice, 1 cup sofrito sauce (follow the link to find the recipe), 1 cup vegetable stock, 1 tbsp. vegetarian oyster sauce, 2 cups mixed steamed vegetables of your choice such as broccoli, cauliflower, peppers, sweet peas, mushrooms, etc., 1 tbsp. chopped onion, 1 garlic clove, chopped, 2 tbsp. olive oil, 50 ml. dry white wine, salt and freshly ground black pepper to taste. Recipe: Rinse the rice with cold water and boil it until fully cooked but still a little bit hard, about 1 minute away from being cooked to your taste. Strain the rice and wash it with cold water. In a large non-stick skillet (or cast iron pan) saute the onion and garlic in the olive oil for 2 minutes. Add the steamed vegetables and saute for 3 minutes more. Deglaze with the white wine and add the oyster sauce, vegetable stock and sofrito sauce. Bring the sauce to a boil and add the boiled rice. Reduce the temperature and simmer the vegetarian paella for about 10 minutes, tossing it with the skillet to stir only a few times. When the desired consistency is achieved, taste for salt and serve the vegetarian paella in two pasta bowls or directly with the skillet. Ingredients: 1/2 package phillo dough, 1/2 pound crumbled feta cheese, 3/4 pound frozen spinach, thawed and drained, 4 eggs, 4 tablespoons milk, 2 tablespoons melted butter, 1 teaspoon salt, white pepper to taste. Recipe: In a bowl, mix the feta, spinach, eggs, milk, salt and pepper. Grease a baking pan, the size of 1/2 phillo sheet and place a folded phillo sheet at the bottom. Spoon some of the spinach mixture over the phillo and repeat until you finish all the ingredients. After every new layer, brush the phillo with the melted butter. With a sharp knife cut the pie in the pan to triangles or whatever shape and size you would like them to be when they are cooked. Cook in a preheated oven at medium-high until the pie grows in size and is golden and crispy on top. 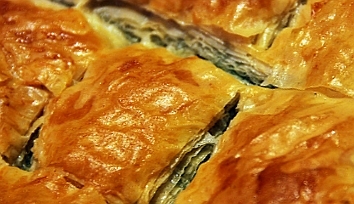 Let the spinach pie sit for 10 minutes and serve. Ingredients: 1 large eggplant, 1 cup flour, 1 cup breadcrumbs, 1 large egg, 2 ounces heavy cream, 1 tablespoon grated Parmesan cheese, 1 teaspoon dried herbs (Italian mix), 1/2 cup tomato sauce, 1/2 cup mozzarella cheese,1 1/2 teaspoon salt, black pepper to taste, vegetable oil for frying, as needed. Recipe for 4: Peel the eggplant (optional) and slice it lengthwise to 4 nice, 2/3 inch thick slices. Press every eggplant slice between 2 pieces of tissue paper to absorb the extra moisture. Beat the egg with the heavy cream in a bowl. Mix the Parmesan cheese, breadcrumbs, dried herbs, salt and black pepper in another bowl. Dredge the eggplant slices in the flour and then dip them in the egg mixture. After the eggs, press each eggplant slice in the breadcrumb mixture to coat it completely. Heat some oil in a frying pan over medium heat and cook the eggplant parmesans on both sides until golden and crispy outside and relatively soft to touch - about 4 minutes for each side. When ready, place the eggplant parmesans on a baking pan, spoon little tomato sauce over each slice and cover with shredded or sliced mozzarella cheese. Bake until the cheese is melted and bubbly. Serve the eggplant parmesan with penne tomato-basil on the side. Ingredients: 1 cup semolina, 4 cups water, 2 tbsp. olive oil, 2 tbsp. chopped onion, 1 tsp. chopped garlic, 1/4 cup chopped red pepper, salt and freshly ground black pepper to taste. Recipe: Heat the olive oil in a large heavy saucepan, and saute the onion, garlic, and red pepper for 5 minutes. Add the water and bring to a boil. Turn off the heat and stir in the semolina gradually, while stirring. Turn the heat back on to low and keep stirring until the polenta mix starts separating easily off the walls of the saucepan. Remove from heat and pour the polenta mix in a greased baking dish. Bake in a preheated oven at 400 F for about 10-15 minutes. Remove from oven and let the polenta stand until it cools down a little bit. Cut and serve. The polenta can be used as a side, or as a meal on its own, topped with some warm tomato-basil sauce. It can, also, be topped with feta cheese or goat cheese before baking, if desired. Ingredients: 4 large portabella mushrooms, 1/2 cup artichoke from a can, quartered, 1/2 cup sliced roasted red peppers, 1 teaspoon minced garlic, 1 tablespoon olive oil, 1 tablespoon chopped parsley, 2 tablespoons breadcrumbs, 1 tablespoon balsamic vinegar, 1/2 cup grated mozzarella cheese, 1 teaspoon salt, black pepper to taste. Recipe: Mix the olive oil with the minced garlic and brush the portabella mushrooms on both sides. Grill the portabella mushrooms until they have nice grill marks on both sides. In a bowl, mix the artichoke, red peppers, parsley, balsamic vinegar, salt and pepper and spoon the mixture over the 4 portabella mushrooms. Sprinkle with the breadcrumbs and bake until golden on top. Sprinkle the mozzarella on top and continue baking until the cheese is melted and bubbly. Serve the portabella mushroom with spring mix salad on the side. Ingredients for 4 individual casseroles: 3 zucchini, 2 eggplants, 1 tablespoon mixed dried herbs, 2 tablespoons olive oil, 1 teaspoon minced garlic, 1 tablespoon fresh basil, 3/4 pound fresh buffalo mozzarella, 6 oz. tomato sauce, salt and pepper to taste, 1 cup warm tomato sauce for serving. Recipe: Slice the eggplant and zucchini and toss them in a mixing bowl with the olive oil, dried herbs, garlic and season to taste. Grill the zucchini and eggplant until they have nice grill marks. Put 1 tablespoon of tomato sauce at the bottom of every casserole. Place a slice of buffalo mozzarella over the tomato sauce. Layer the some grilled zucchini and eggplant over the buffalo mozzarella and repeat until you run out of stuff. After each layer sprinkle with fresh basil. Bake in a preheated oven at medium-high for 20 minutes. Let the casserole sit for about 10 minutes and then turn in upside down in a plate where you have put some warm tomato sauce. Ingredients: 3 - 300 gr. cans of artichoke hearts, drained, 2 eggs, 1 cup flour, 1 cup breadcrumbs, 1 tablespoon chopped parsley, 1 heaping tablespoon grated Parmesan cheese, 1 teaspoon vegetable stock on powder, 1 tablespoon whipping cream, salt and white pepper to taste. For Red Pepper Mayo: 1 cup mayonnaise, 2 roaster red peppers from a can, 4 cloves garlic, 1 teaspoon chopped parsley. Recipe: Beat the eggs with the cream. In a bowl, mix the breadcrumbs, Parmesan cheese, vegetable stock base, chopped parsley, salt and pepper. Bread the artichoke hearts by the method flour - egg - breadcrumbs and deep - fry them at 160 C. Drain the cooked artichoke parmesans over tissue pepper if necessary. 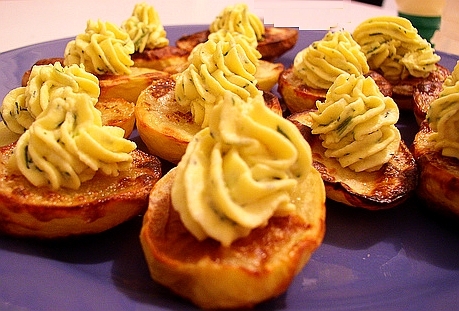 Normally the artichoke parmesans do not absorb too much oil during cooking. Serve with the red pepper mayo on the side. For the red pepper mayo, put all the ingredients in a food processor and blend. Ingredients for 4: 4 large bell peppers or 8 smaller ones, 1 cup rice, 1 sliced onion, 1 teaspoon summer savory, 1/2 cup grated carrots, 1/4 cup thinly sliced celery, 1 cup vegetable stock or water, 3 tablespoons olive oil, 2 bay leafs, 1 tablespoon chopped parsley, 1/2 cup tomato sauce. Recipe: Heat the oil in a large skillet and saute the onions, carrot and celery. Add the summer savory, bay leaf and rice and saute until the rice is almost transparent. Add the stock and tomato sauce and stir until the rice absorbs all the liquid. Remove the bay leaf. Fill the peppers with the rice stuffing but leave some space, as the rice will grow when cooked. Arrange the stuffed peppers in a baking pan and pour 1/2 cup of water at the bottom of the pan. Bake until the rice is cooked. Serve on the side some grated Parmesan or other grating cheese such as Grana di Padano, Piave Vecchio, Pecorino Romano, Pecorino Crotonese, etc. Ingredients: For the polenta you can use the recipe above; For grilled vegetables you can use sliced eggplant, sliced zucchini, mushrooms, bell peppers, asparagus, leeks, red onions, etc. You can even add a couple of sauteed vegetables, such as broccoli and carrots, for color. 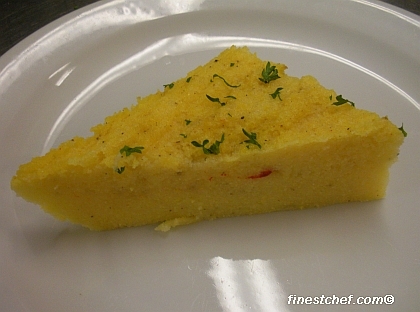 Recipe: Using the polenta recipe from above on this page, make a dish of polenta that is only about 1-inch thick. 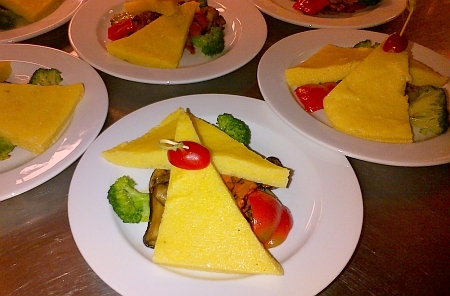 You should wait for the polenta to cool down a little bit, before cutting it into the shapes from the photo. Grilling the vegetables is just common sense. Right before serving you can drizzle the entrees with some balsamic reduction. Ingredients for 4: 1 cup asparagus, sliced, 2 cups risotto rice, 1 teaspoon minced garlic, 1 chopped onion, 4 tablespoon olive oil, 1/4 cup sliced sun-dried tomato, 1/4 cup grated Parmesan cheese, 4 cups vegetable stock, 1/4 cup white wine, salt and pepper to taste, 1 large pinch dried oregano, 1 bay leaf. Recipe: Wash the rice and cook it in the vegetable stock and white wine over medium heat in rice cooker, until it absorbs all the liquid. When done, the rice should be still a little crunchy, not overcooked. In a large frying pan, heat the oil and saute the garlic and onion. Add the asparagus, sun-dried tomato and herbs, and saute until the asparagus is soft. Add the boiled rice and keep stirring until the rice is well incorporated and cooked. If needed, add some more vegetable stock to the risotto. Remove the bay leaf and fold in the Parmesan cheese. Season to taste and serve with some more Parmesan on top. This vegetarian recipe is very popular with all non-vegetarians.